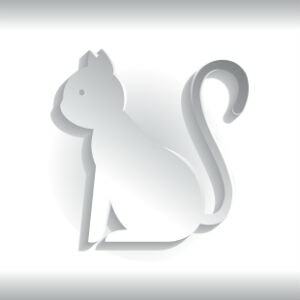 We all know that there is a high chance for a white cat to be deaf, but did you know that not all white cats are really white? There are three types of white cats – albinos, leucistic cats, and white cats. An albino can be leucistic, and a leucistic can be considered a white cat. But a white cat may be leucistic but not an albino. Sounds a bit confusing, right? Because of this somewhat convoluted classification of “white” cats, there have also been some misunderstandings regarding the probability of “any white” kitty being deaf. What then is the difference between an albino cat and a white cat? And what are leucistic cats? Albinism is a rare genetic phenomenon among animals characterized by an unusual lack of pigmentation – less so than what is dominantly found in the various generations of both parents of an albino. This is because albinism is a recessive gene and requires two parents to have such a recessive gene to produce an albino offspring. There are two types of albinism – pure and partial. Pure albinism is characterized by reduced or absence of melanin production. Because of this, the only pigment remaining in the body is the color of blood cells. Light passes through various colorless cells in the body and gets reflected or refracted, except for areas where blood cells are present. These multiple layers of red cells are the ones responsible in giving the red colors in your albino kitty’s eyes as well as the pinkish tinge on its skin. An albino kitty is mistaken as white because its fur which lacks melanin appears white. This is so, thanks to the light which passes through several layers of semi-transparent hair. You have probably seen how nylon fiber light decorations work – that is basically how your albino kitty becomes white – light passes and is bent and reflected several times through various strands of fur that it appears white in our vision. The occurrence of albinism in cats is very minimal – partial albinos aside, only about 2% of the total feline population are albinos. Partially albino kitties, leucistic cats, as well as white tabbies share a similar trait in terms of the coloration of the cat’s coat – their hair actually lacks melanin. If that is the case, what makes them different from albinos? Leucism is a partial lack of all pigment coloration in animals except for black. This is because certain cells in a particular area of the body lack the ability to produce pigments which results to appearing like albinos but still retaining some darker color in the cats’ eyes, dark stripes and spots (if their breed happens to have it), and dark nose. Certain cat breeds have a high chance of exhibiting a certain form of partial albinism called point coloration. Oriental breeds like Siamese, Burmese, Tonkinese, and Thai have color-pointed coats which are indications of this genetic phenomenon. Unlike pure albinos, partial albino cats may still develop color patterns as they grow older but they are always at the cooler areas of their body. A certain common denominator between leucistic and white cats compared to albinos is the color of their skin and the tone of their fur in relation to the skin. This is especially easy to identify if your pet puss is still a kitten. Leucistic and white cats tend to have a grayish or white skin tone. Albinos, because of lack of pigmentation, tend to be more pinkish and their fur leans toward the pink rather than having a tinge of gray or light cream. 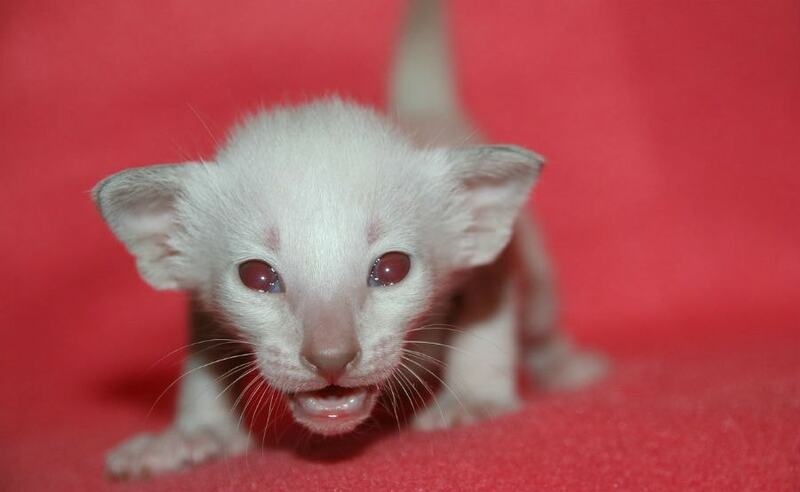 Another way to differentiate pure albino felines from other white cats is through their eyes. Lack of pigmentation tends to make pure albino furball red-eyes. Some may have very little pigment still remaining which will attribute to their very light blue or pinkish light blue eyes. Felines with point coloration, on the other hand, tend to have lighter-colored eyes rather than darker colors. Kitties with Leucism and other white cats may have yellow, green or blue orbs. Leucistic cats, unlike other white cats, may have either all-blue eyes or heterochromia – a combination of one blue eye and a green or yellow eye. It has been observed that white cats have a high chance to be deaf. Because of this partial belief, various misunderstandings have sprung up and need to be cleared. One of the pervading myths is that albino house cats have a high tendency to be deaf. This belief came from the misunderstanding that albino kitties are white. As mentioned earlier, the coloration of albinos came from the cat hair’s ability to reflect and refract white light – albino cat hair, in the first place, lacks pigmentation and therefore cannot be identified as white. Additionally, the gene for albinism, white hair, and deafness are unrelated – more so albinism and deafness. There have been cases of albinos that are deaf but these are rarer than albino cats themselves. Another myth that needs to be corrected is the frequency of deaf cats among these white furballs. Deafness in cats is actually more linked to the combination of white fur and blue eye color. White cats that have heterochromia have an increased chance of 30% – 40% being deaf, and a point of interest is that whichever side has the blue eyes also tend to be the side with deaf ear. The probability of deafness increases further for kitties with all-blue eyes – 60% – 80% of white felines with blue eyes also have a hearing impairment. Meanwhile, there is only 10% – 20% probability of being deaf among cats with green or yellow eyes. Both albino and white kitties including partial albinos and leucistic cats lack in melanin which protects the skin and eyes from the sun’s harmful rays. Because of this, we cat parents should be very careful with our feisty felines’ access to direct sunlight. Leave them basking in the sun and you will risk them sunburn, if not skin cancer. Albinos even need more care. They are not only susceptible to skin cancer and eye damage from exposure to ultraviolet rays from the sun but their lack of melanin causes lack of visual perception, tracking, and focusing. These kitty companions, however, can adapt well to loving hoomans and staying well indoors, so all the more reason to keep them safe inside your homes if you have one. Leucistic cats and blue-eyed cats, on the other hand – even those with one-blue orb heterochromia – have to be checked for deafness. This can be done by making a noise or calling their attention while they are not looking at you. Not glancing your way could be an indicator of hearing impairment. Another good way would be to consult with your vet for any hearing test. If you have confirmed that your kitty is deaf, have it stay indoors all the time. Deaf or partially deaf cats have to be kept safe and away from busy areas where they could meet accidents. In addition, these cats are also white, so it is rather better to keep them out of the sun as well so as not to expose their skin and risk sunburn.